crepes are one of my favorite things to have for breakfast. i especially love crepes stuffed with fresh strawberries. i love how crepes are lighter than pancakes. they just seem so delicate. 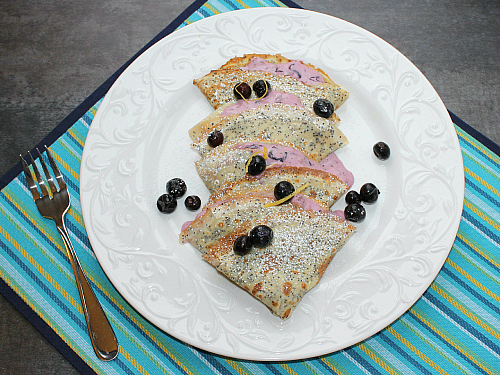 recently we made lemon poppy seed crepes. 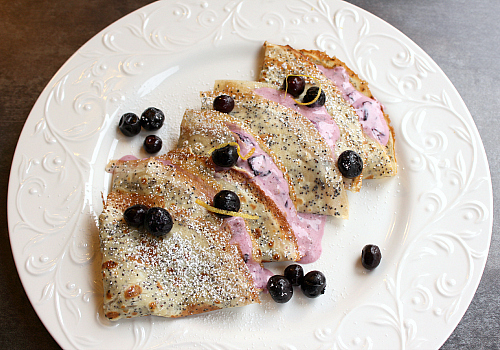 fresh lemon gave the crepes a wonderful bright flavor, and the poppy seeds gave them a great crunch. instead of stuffing our crepes with slices of fresh fruit like we usually do, we make a lemon blueberry cream cheese filling to spread inside the crepes. let me tell you, this filling might just be my new favorite thing (and i'm not even a fan of blueberries normally). i want to spread it on everything! it is so delicious and it has the most beautiful purple color too. you could easily swap out the blueberries in the filling for strawberries or raspberries instead. either would be super yummy! 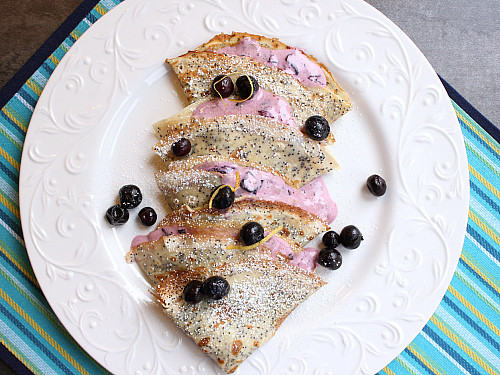 to make the crepes, combine the egg, milk, vanilla, lemon juice, lemon zest, and poppy seeds in a large bowl. whisk until combined. add the flour and sugar, then whisk until smooth and no lumps remain. the batter will be very thin. heat a small 8 inch non-stick frying pan over low heat. grease the pan with butter and pour 1/4 cup of the batter into the pan. allow the batter to cook until the edges begin to curl away from the sides of the pan (about 2-3 minutes). flip the crepe over and allow the other side to cook (about 1-2 minutes). be careful to not let the crepe burn. remove the crepe from the pan and place it on a plate. repeat with remaining batter. to make the filling, combine the softened cream cheese, powdered sugar, lemon juice, and vanilla. beat with an electric hand mixer until smooth, then add the blueberries and smash the berries with a fork. mix the berries thoroughly into the filling. spread the filling on each of the crepes. either roll or fold the crepes. dust with powdered sugar, and top with additional berries and lemon zest. Looks great. They kind of remind me of Blintzes. My mom would make Blintzes all the time. I do a quick version and I think I was the only one who like my version.